Apples are probably the easiest tree fruit to grow and the most popular with gardeners. You may be lucky enough to have one in your garden already, but if not, they are easy to establish. There are thousands of different types of apples, but they broadly fall into two categories: dessert apples for eating, and cookers, as the name suggest, for cooking. Some are dual-purpose, so suitable for both uses. Once established, apples require very little care throughout the year. Water apples during dry spells and from when the fruit starts to swell, particularly if they are newly planted or in containers. The most effective method of doing this for rows of fruit trees is to place a drip line or seep hose under the trees. Large, established trees will be more resistant to periods of drought. In early spring, sprinkle a balanced general fertiliser (such as Growmore) around the base of the plant, following the manufacturer’s instructions. Apples should be pruned every year to get the best crop. Timing and method of pruning depends on the type of apple you are growing. We have extensive advice on apple pruning. If you don’t have an apple tree in your garden, planting one is a good investment, for there is nothing like eating the fresh fruit straight from the tree in autumn. It's generally recommended to buy named cultivars of apples from a reputable specialist nursery. They are supplied as young trees ready for planting. Sowing apples from their pips would just take too long, and just as children are not identical to their parents, fruit trees are not true to type when reproduced from seed. The ideal position for an apple tree is a sunny, sheltered site, well away from any frost pockets. Avoid poorly-drained or shallow soils. You will see apple trees for sale in two forms: bare-root stock (as the name suggested, the roots are exposed when you purchase these plants) or in containers. Bare-root plants should be planted from late autumn until early spring; containerised plants can be planted at any time of year, though winter is preferred. If planting in the garden, dig a hole no deeper than the roots, but up to three times the diameter of the root system (spread the roots out on the ground before digging the hole). If the sides or base of the planting hole are really hard, break the soil up with a fork before planting. Place the plant in the planting hole and carefully refill, placing soil between and around all the roots to eliminate air pockets. Firm the soil gently by stepping on it. If you want to grow an apple in a container you must choose one that has been specially grown for a container. Apple trees are not grown on their own roots. The top of the tree is grafted onto different roots (called a rootstock), and the roots control the size of the tree. Therefore, when you are choosing an apple for a container you must make sure it is grafted onto a container rootstock. Look out for rootstocks called ‘M26’ for a container. If growing in a container, choose one that is 45-50cm (18-20in) in diameter. When planting, place some crocks (small pieces of broken concrete, clay pots, or polystyrene) in the bottom of the containers to retain moisture. Use a good-quality compost (John Innes No 3 is ideal), or multi-purpose compost mixed with one-third by volume of grit. Aftercare is very important for new trees, so read more about looking after young apple trees in our advice profile. Apple scab: Dark green patches appear on leaves followed by raised, brown or black corky scabs on the surface of the fruit. Light attacks only damage the skin and eating quality is hardly affected. In severe cases, the fruit may split. Scab is caused by a fungus. Remedy: Prune out infected stems or shoots, and burn or compost fallen leaves and infected fruit, which will help prevent the spread. Apple sawfly: The sawfly lays its eggs in apple blossom. When the larvae hatch they create scar-like markings on the skin of the forming fruits. Remedy: Remove damaged fruitlets to prevent larvae moving to other fruitlets. Brown rot: Brown rot is a fungal disease causing a brown, spreading rot in fruit, sometimes with white pustules of fungi on the surface. It is usually worse in wet summers. Remedy: Remove all rotten fruit as soon as you see it and destroy, this will prevent the spread of the rot. Bitter pit: This is a physiological problem, caused by the growing conditions, not a pest or disease. Sunken holes appear on the surface of the fruit, and underneath the fruit is discoloured. You can still eat the apples. It is caused by poor levels of calcium in the plant and erratic watering. Remedy: Correct feeding and watering to maintain steady growth throughout the growing season is the key to reducing problems with bitter pit. As with most fruit, the obvious method of testing if it is ready for picking is to taste it. The other indication of an apple being ready to pick is that there are a few lying on the ground around the tree (called windfalls). The fruit should have swelled up to a good size and started to colour up. To pick an apple, cup it in your hand, lift gently and give a slight twist. It should come off easily with the stalk intact. If it doesn’t, then it’s not ready for picking. Early apples need to be eaten within one or two days after picking, while some of the later fruits can last for months, if kept properly. Store in a dark, cool place - a cellar is ideal; a shed or garage is the next best option. A slight humidity in the atmosphere also helps to preserve the fruit. Ideal temperatures are 2-5°C (35-41°F). Good ventilation is important, so store apples in slatted wooden or plastic crates or boxes, spreading the fruit out evenly and ensuring they do not touch each other. The fruit can also be wrapped in paper to help prevent contact. Check over the fruits frequently removing any ones showing signs of rot. This wonderful apple, almond and honey dessert cake is open and full of flavour and perfect for using up windfall apples in season. 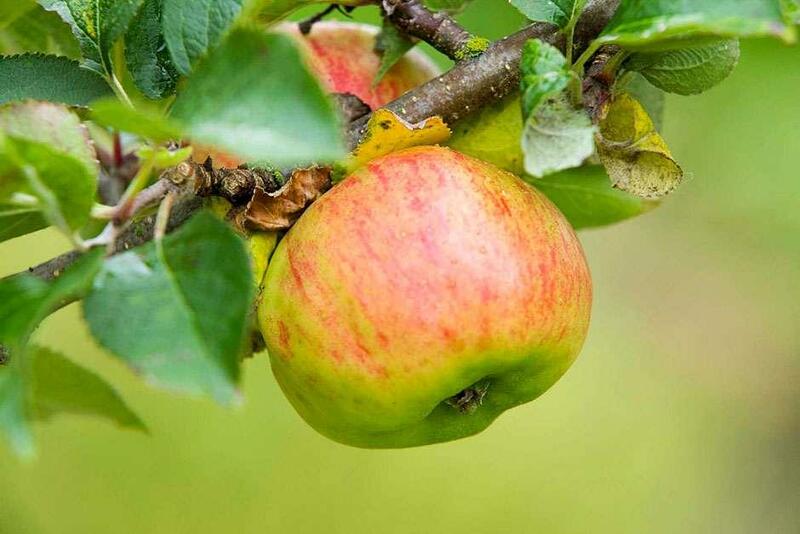 Your best bet when choosing an apple for your garden is to do your research before purchasing, and buy from a specialist nursery that can give you individual advice. ‘Pixie’ AGM:This dessert apple produces small, juicy apples, ideal for children. Produces high yields. ‘Discovery’ AGM:This flushed-red dessert apple is probably the tastiest and juiciest of all the early-ripening apples with good, firm flesh. It has good resistance to disease. ‘Egremont Russet’:A dessert type, its intriguing flavour combines honey and nuts. The fruit is small and golden with large patches of russeting and a rough skin. ‘Bramley’s Seedling’ AGM:A very popular cooking apple, needing a lot of space. The apple breaks down to a creamy purée after cooking.